Some days I find myself aggravated with how things are going in my life. And some days, I simply melt into the flow of my life without worry. Does this happen to you? Lately I’m finding inner peace within the confines of my thinking and expanding it outward in spherical circles. It’s as if the Universe/Spirit/God is laying breadcrumbs of courage, of knowledge and of a-ha moments for me to find on my life path. And it’s most certainly interesting, exciting and perhaps even shall I say, titillating! I feel like I’m on fire ~ for what ~ I don’t exactly know. But I don’t think I need to know yet, I think it’s still in pre-launch mode. Launching 2014, laying the groundwork for the year ahead, going with the flow of where life will take me on this special journey. Do you feel it too? Can you get quiet and just be for a bit? 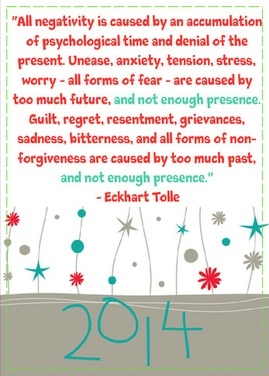 Live in the present moment as Eckhart Tolle reminds us to do…to find the gifts/presents in being present? When I find that I am getting aggravated, I simply say, ‘present, presence’ as a gentle reminder for myself. I could perseverate on the past, on conversations spoken, on deeds that are done and over-with, on the woulda coulda shouldas that have caused me pain. I could pursue ‘what if’s’ for my future, planning, controlling, being obstinate with how I feel things should go. Instead, I quietly turn my monkey brain around and just utter, ‘present, presence’ quietly and things just seem to not matter. I’m not saying I don’t have long-term plans in place nor goals because I do. I’ve imagined what I’d like for my life to look like this year and I’m ready to create something big! But I’m also taking baby steps and allowing that red carpet ahead of me to roll out and help me on my way! 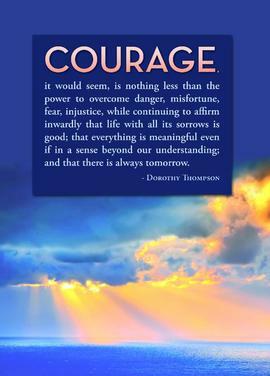 So do you have courage? Can you remember that there’s a tomorrow? Can you find the presence within? Sometimes I need a good dose of reality. I don’t mean to sound preachy, but this sign caught my eye today on Pinterest ~ by the way, click here to buy it! and I felt like it was a good reminder for me and to share here. I”m not much of a stone thrower, I’m rather weak ~ but I have been known to throw a few ~ most notably the snowball which was ice encrusted (and I honestly didn’t know) that I threw at my Sissy as a kid. Shocking to both of us since my aim is really off, I hit her square in the eye and gave her a black eye when we were little! Boy did I get in trouble on that one! We were just playing snowball fight and I guess I packed a wallop of a snowball! I would love to tell you that I learned my lesson and I don’t throw them anymore, but that’s untrue. Now I just aim for your feet so that I hit you in the torso ~ and I make sure that it’s not a hard ice-ball snowball! Words ~ ay yay yay! This one’s a toughie because I wish I could eat a few of the words that have escaped my lips over the years. Unfortunately, I have saddened myself and others and this is one that I monitor now that I’ve learned. On the flip side, there are phrases which replay over and over in my head rent free that I wish I’d never heard. Since I can only control myself, I am working on my words and trying to evict those harsh words running rampant in my brain and heart. Occasions ~ this one makes me sad as there are a few moments in my memory that I wish I’d gone out of my comfort zone to do something, to say something, to do more than to recognize the occasion as ‘one I could say/do such and such’ and instead, I allowed the moment to pass. Regretfully, I admit there are times that I should have taken the opportunity/occasion to say yes to opportunity instead of staying safe, playing it cool and regretfully even turning away. Time ~ When one loses a loved one, time is what we crave, regrets are what we wallow in and we hold tight to the time we spent with them. But instead of lamenting after the passing of our loved ones, here’s the once in a lifetime chance to use our time now wisely! We have all the time in the world ~ why not use it while we are here on Earth and while we are among the living! Bottom line ~ live in the now ~ enjoy the Presents of Presence ~ put down stones (and icy snowballs), watch our words, never allow the occasion to pass us by and wring all of the love and presence out of every single blessed moment of our time here!! Perhaps keeping this little saying in the back of your mind will help you to enjoy the holidays more and to make more memories to cherish! Do you have stones, words, occasions and time that you wish you could change? Please don’t tell me I’m the only one after I’ve laid my heart out for you! 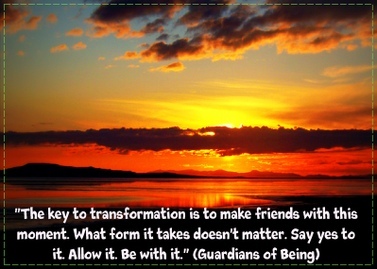 “The key to transformation is to make friends with this moment. from Eckhart Tolle’s Present Moment email this morning! Yesterday’s worry post and today’s email from Eckhart made me think that there was more to say about worry. So, I searched in our friendly WP reader to see what others had to say about worry and boy do we WP bloggers have a lot to say! I just picked up a few links to share with you, but I thought they were all interesting ways to deal with worry. Many come from a spiritual place, allowing faith in God to thwart the evil worry gene, while others use simple quote reminders to eradicate worry from our brains. Either way, I thought it would be a great moment to expand our village in order to loosen the bonds of worry in our lives. I hope you enjoy a few bloggers that you may not have seen before ~ and perhaps you’ll learn a new quote to help you get rid of worry in your life once and for all! 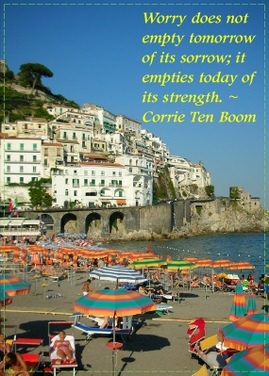 *I took the liberty of making some of their quotes into posters and cards with my SendOutCards account. See my post https://misifusa.wordpress.com/2013/04/11/make-this-world-a-better-place// for more information. 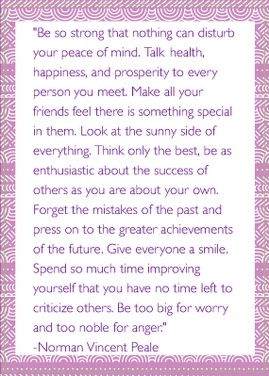 Shine On and Worry Less My Friends!